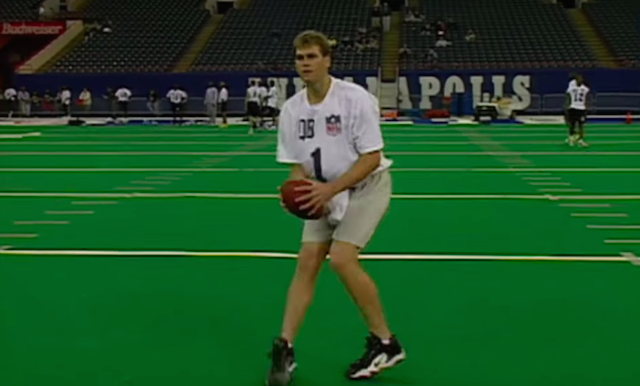 Tom Brady didn't exactly look like a burgeoning star at the 2000 NFL combine. The NFL combine kicks off this week in Indianapolis. 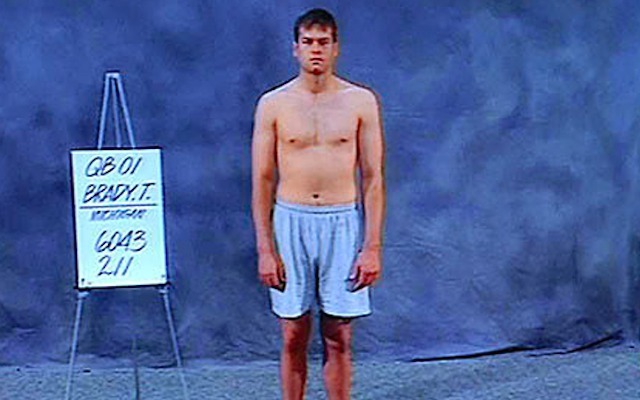 Some players will see their draft stock shoot up after the combine, some will see their draft stock fall, but whatever happens, there's a good chance no one will match Tom Brady's legendary NFL combine of 2000 -- and keep in mind, it's only legendary for how bad it was. The NFL decided to release some of Brady's combine footage this week, which means we can now relive some of Brady's "greatest" moments, like his 5.28-second 40-yard dash. Fifteen years later, Brady's 40 time still stands as the slowest among active NFL starting quarterbacks -- and it's really not even close. Philip Rivers, who's not exactly known for his blazing speed, ran 5.08 in 2004. Even Nick Foles managed to top Brady, running a 5.03 in 2012. Brady also struggled with his vertical jump at the combine. The former Michigan quarterback only got 24½ inches in the air. To put that in perspective, Raiders quarterback Derek Carr had a 34½-inch jump at the 2014 combine. Of course, 40 times and vertical jumping ability have absolutely nothing to do with someone's ability to play quarterback, as Brady has proved many, many, many, many times over. To check out the footage from Brady's workout, head over to the NFL's YouTube channel here. Finally, if someone struggles at the combine this week, be sure not to write them off because they could go on to marry a supermodel and win four Super Bowls, like the guy below.